Immigrant rights activists protest Sheriff Stanek fundraiser | Fight Back! Minneapolis, MN - Chanting, “Stanek says deportation! 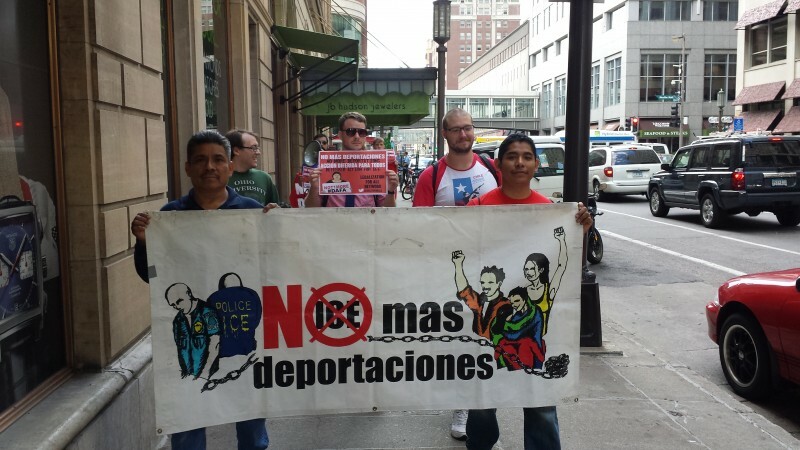 We say no!” 30 immigrant rights activists protested outside Hennepin County Sheriff Richard Stanek’s reelection campaign fundraiser here June 4. Protesters marched around the busy downtown intersection of Nicollet and 9th Street for an hour, while chanting, handing out flyers and engaging the public. Stanek’s fundraiser was inside at the Minneapolis Downtown Council office. Two activists tried to enter Sheriff Stanek’s fundraiser but were immediately confronted by police, threatened with arrest and kicked out. 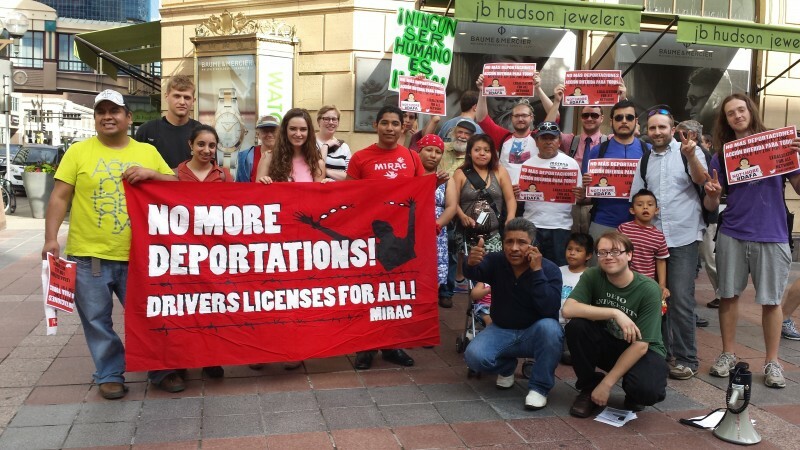 The protest was organized by the No More Deportations campaign of the Minnesota Immigrant Rights Action Committee (MIRAC). Protesters were highly visible marching in the crowded Nicollet Mall area, educating the public about Sheriff Stanek’s role in deporting immigrants and separating families. More immigrants are deported from Sheriff Stanek’s Hennepin County jail than any other in Minnesota. Stanek has also lobbied for anti-immigrant legislation at the state legislature. Stanek is running for reelection in November so he has been campaigning in many communities, including in the Latino community, smiling and waving on a float in the Cinco de Mayo parade on Lake Street. Activists with MIRAC’s No More Deportations campaign say they will continue to pressure Sheriff Stanek until he agrees to stop cooperating with Immigrations and Customs Enforcement’s ‘hold requests’ on immigrants in the Hennepin County jail. The activists see this as a way to prevent deportations that separate families. 2 million people have been deported since President Obama took office in 2009, more than Bush deported during his entire eight years in office, and more than any other president in U.S. history. While immigrant rights activists continue to push President Obama to take executive action to stop deportations nationally, campaigns are gaining momentum on the local level to pressure sheriffs to stop cooperating with ICE in detaining and deporting so many people. These campaigns have been successful in several major cities and counties around the country. On June 4, the same day as the Minneapolis protest, there was a victory in San Diego county in California where Sheriff Bill Gore said in a statement, "The Sheriff's Department will no longer hold someone past their release date based on an ICE detainer alone.” A recent federal court decision has bolstered activists’ efforts to get local sheriffs to stop honoring ICE hold requests. The court decision held that a local jail had violated the Fourth Amendment by granting the detainer request without probable cause or a court-approved warrant.